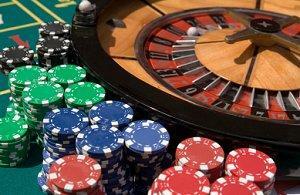 Casino games are popular for Mardi Gras parties. Mardi Gras interactive games can bring a party to life with the spirit of indulgence and exhilaration characteristic of this wild holiday. Interactive games take standard party games to the next level by involving all guests in the fun. Mardi Gras, in particular, is an expressive holiday full of lively sounds, sights, smells, and tastes, and adding interactive games to the party events can make it a fun time for everyone. Levels of interaction may vary, however, and reluctant or reserved party guests should not be intimidated into participating if they would rather observe. By choosing a variety of different party games, hosts can ensure there are fun activities for everyone to enjoy. Casino Games: Taking chances is an inherent part of this holiday, and casino games can be a fun way for guests to press their luck. Colorful chocolate doubloons can double as gambling chips and indulgent treats. Karaoke Contests: Singing blues or jazz tunes is a crazy way to liven up any Mardi Gras party. Talent Showcase: Guests can demonstrate their crazy and unique talents for this crazy and unique holiday. Murder Mystery: A sudden murder with a Big Easy flair can be an intricate and mind-boggling game as guests become super sleuths to solve the crime. Mystery Masks: Give each guest a unique mask at the beginning of the party and encourage them to ask other party goers yes or no questions to determine just who that mask represents. Pass the Beads: Teams of guests must pass a string of Mardi Gras beads from one end of a line to another, with the beads gracing every team members' neck in turn, without using their hands to move the beads. Masquerade Mixer: Invite guests to wear wild and crazy costumes to the party and exchange pieces of those costumes to create the most outrageous look. Piñatas: Mardi Gras party piñatas can be fun for all ages - choose piñatas with mask, jazz instrument, or other Mardi Gras shapes and colors for added flair. Fill the piñata with beads, noisemakers, treats, and other trinkets in Mardi Gras colors, shapes, and designs. How many Mardi Gras beads can you wear? Cookie Decorating: This "Fat Tuesday" holiday is about indulgence, and a cookie decorating contest can offer prizes for the most colorful, craziest, or most calorie-laden cookie creation. King of Beads: This game requires teams of players where one member is designated the "king of beads" and the object is to get them to wear as many strings of Mardi Gras beads as possible. Party planners should be prepared, however; a creative and persistent team may use 100 strings of beads or more! Bead Stringing: A more laid back game and one suitable for younger guests is to create personalized strings of Mardi Gras beads from loose purple, green, and gold beads. Unique bead shapes and different sizes can add even more creativity to this craft. No party games are complete without prizes to inspire the best efforts of competitors. Mardi Gras beads are a perfect choice to give to all participants, while winners may receive more elaborate strings of beads or other trinkets such as small trophies, the honor of wearing a jester hat or crown, or some pivotal role in the next game. Despite the best intentions of those planning Mardi Gras interactive games and other activities, they can be nerve-wracking or intimidating for shy or reserved guests. Hosts should never force anyone to participate who is not willing to do so, and having additional "assistant" roles for non-players to fulfill can help keep everyone involved without making anyone uncomfortable. Extra guests may keep score, serve as judges, or award prizes. Furthermore, in the spirit of fun and celebration, every guest's participation should be honored with a small, fun trinket or a kind word as thanks for participating. Mardi Gras interactive games are a fun way to get everyone involved in the festivities and to work up appetites for Fat Tuesday treats. From simple crafts to intellectual challenges to wild competitions, there are many different outrageous party games available to turn a plain Mardi Gras party into a boisterous celebration.